Home » Articles » Please, Stop Crying! 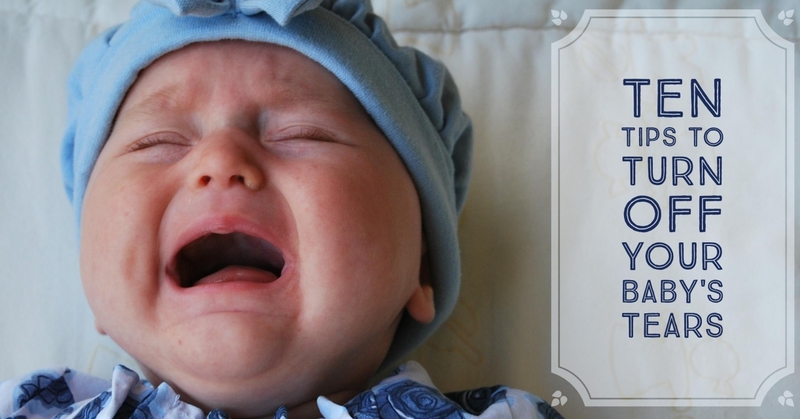 Ten tips to turn off your baby's tears. By the time Andrew and Beth brought baby Lindsay home from the hospital, she had only cried a few times. Beth was relieved and quite happy to think motherhood was this easy! During the first few weeks, Lindsay was the happiest newborn on the block, eating, sleeping and playing, and all with very few tears. Just one month later, Yikes, what happened to our little angel?, cried Beth in unison with baby Lindsay's wailing. The first few weeks of a newborn's life require many adjustments. The sounds, the smells, the light, the temperature; in fact, the baby's whole world is new. Remember, that baby was used to being in a small, dark, warm environment with the very loud sounds of the heartbeat and the sway of the mother's movements. It was that way for the first nine months of the baby's existence. Then, suddenly, it's entirely different. No wonder babies cry! Everything changes for a new Mom and Dad, too. There are new demands, new sounds (crying, cooing), new sleep patterns (or lack of sleep) and new feelings of love for their baby. And then the sudden, sobering realization that they are now totally responsible for another human being, 24 hours a day. Help! Where are the instructions? Nothing is more disconcerting to new parents than hearing their baby cry. Babies cry for many reasons, and sometimes they cry for no reason at all. But there's no need to panic. Here are some tips that will help keep the tears and wails at bay, and help keep mommy and daddy's sanity intact! Is there a tiny piece of hair wrapped around his finger, cutting off circulation? Is the elastic on his diaper pinching his legs? Is her adorable little headband too tight? Once you have determined that none of the above is a problem, try the following tips to turn off those tears. Take a receiving blanket and put it in the dryer for four to five minutes, making it nice and warm (not hot!). Cover or swaddle the baby with it. Nothing is more comforting than a warm blanket. Swaddle the baby in the warm receiving blanket by doing the following: Lay the blanket on the changing table or in the crib so it looks like a triangle. Lay the baby down so his head is resting on the top point of the blanket; gently place his hands at his sides. Pull up the middle of the blanket to his chest (folding it down at the top if it comes up above his chin). Take the left side of the blanket and wrap it around his right side tucking it under his back. Take the right side of the blanket and wrap it around his left side, pulling it snugly behind his back. You can now lay him in the crib, bouncy seat or car seat in this swaddled position. After swaddling your baby in the warm receiving blanket, turn on the clothes dryer and place him on his back or side on top of the running dryer. (Don't leave him alone). Put one hand on the baby's tummy and gently stroke his cheek with the other. The warmth from the receiving blanket, the gentle strokes and the vibrations from the dryer with help stop any baby's tears. You can also place the bouncy seat or the car seat on top of the dryer with your swaddled baby buckled in. Prepare a warm bath, testing the temperature with your elbow or wrist. Place the baby in the bath and gently pour water over the back of his head while singing your favorite song. Sit in your rocking chair and gently stroke the baby's cheek with your fingertips, like a feather, while rocking slowly back and forth. Sit in a chair and place the baby across your knees on his tummy. Slowly rock your knees back and forth while rubbing his back. Put the baby in the swing. Take one of your t-shirts and roll it up like a jelly roll. Place the shirt next to your baby's cheek on his shoulder and position it so he can also touch it with his hand. Babies are very tactile. What could be more comforting than something soft to touch that smells like mommy? Take the baby outside. A change in scenery is not only interesting, but a good distraction for a crying baby. Put the baby in the stroller and just wheel him around the house. The motion will be very calming. Try turning on the vacuum cleaner, hair dryer or put the radio on a static station. This type of white noise can be very comforting to some babies. Remember, the baby is used to very loud swishing sounds in the mother’s womb. It is normal for babies to cry for any number of reasons. The important thing to remember is not to feel guilty; it doesn't mean that you're not a good mommy or daddy! Try and stay calm, you're both new at this. Your baby can pick up on your stress and this will only make the faucet keep running! Just relax. Before you know it, his tears will be dry. Blythe Lipman, author of Help! My Baby Came Without Instructions (Blythe Lipman) is an infant care expert that has cared for hundreds of babies for more than 20 years. She has worked extensively with new parents on an individual basis providing easy tips to help make that first year with baby a breeze. Blythe lives in Scottsdale, AZ and has two grown children. Visit Blythe at babyinstructions@cox.net or www.babyinstructions.com with your questions and to sign up for free monthly baby tips.